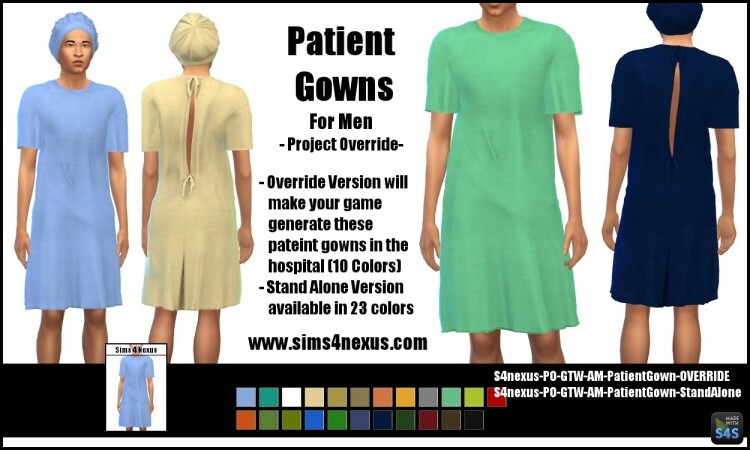 OVERRIDES- The override file will make it so that the male patients at the hospital wear these gowns. They are limited to the 10 colors I included, I do not see how I could add more swatches to the overrides, EA made 10, and I was able to replace each of those. This file is the one with OVERRIDE in the title. Also note, any recolors you have of the EA swatches will then use my mesh instead, and the textures will be off. You can download the other file, which is stand alone, and not override. It will not make it so that male patients automatically wear my gowns. You can still use cheats or the MC Command center to enable my stand alone uniforms as doctor uniforms. GTW is required for the gowns to show up. They should be near the bottom of tops and bottoms in the “everyday” category in CAS. Note: I had trouble getting the game to accept my lower LODS, so if you zoom out you may be able to see the texture looking funny. I don’t think it’ll be very noticeable.